After you have taken the perfect photo or video, it's time to edit it into a masterpiece on a PC. Connect your Gear 360 to a PC, transfer your media files, and then begin working using an editor program. Important: Make sure that your Gear 360 is powered on before you connect it to a PC. Note: Use the supplied USB cable to connect your Gear 360 to a PC. 1. 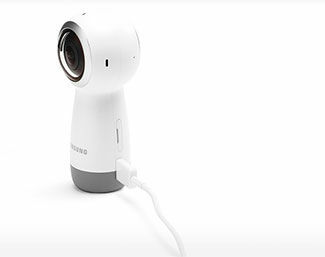 Connect the smaller end of the cable to the multipurpose port on the Gear 360. 2. Connect the larger end of the cable to a USB port on your PC. 3. If this is your first time connecting the Gear 360, additional drivers will be automatically downloaded and installed. Note: Transferring files from the Gear 360 is just like transferring files from a USB flash drive. 1. Connect your Gear 360 to a PC. 2. AutoPlay will appear on the screen. 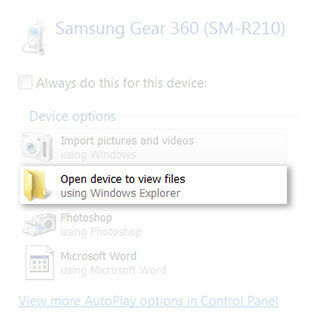 Click on Open device to view files. 3. Navigate to Card > DCIM > 100PHOTO. 4. All of your captured photos and videos will be saved to this folder. Click and drag the file(s) you want to move to the desired location. Note: You can also use the copy and paste functions to move the files.